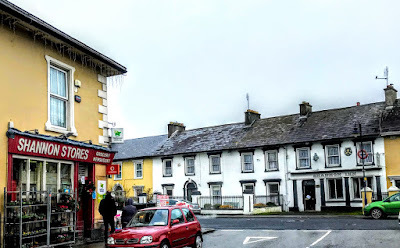 I was writing earlier this week [20 December 2017] about George Peabody and John Bright and their fishing holidays in Castleconnell, Co Limerick, a century and a half ago in the late 1860s, when they went fishing on the River Shannon for salmon and trout. In the 18th century, Castleconnell was a well-known spa resort, and the waters here were reputed to be ‘successful in the treatment of ulcers, bilious complaints, obstruction in the liver and jaundice.’ Because of this reputation, the spa at Castleconnell rivalled Lisdoonvarna in Co Clare as a resort in the Georgian era. 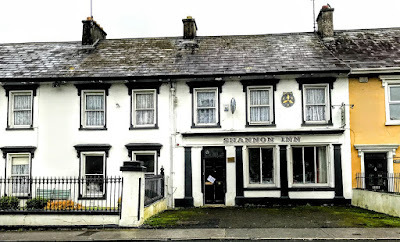 The Shannon Hotel on Main Street, Castleconnell, now known as the Shannon Inn, became the principal hotel for anglers and people who took boats on the River Shannon. Although the Shannon Inn is closed at the moment, it is a landmark building in a prominent location on the Main Street, facing a junction marked out by Saint Joseph’s Roman Catholic Church and Shannon Stores, a surviving Victorian shop whose name illustrates the important role the river has played in the life of Castleconnell. 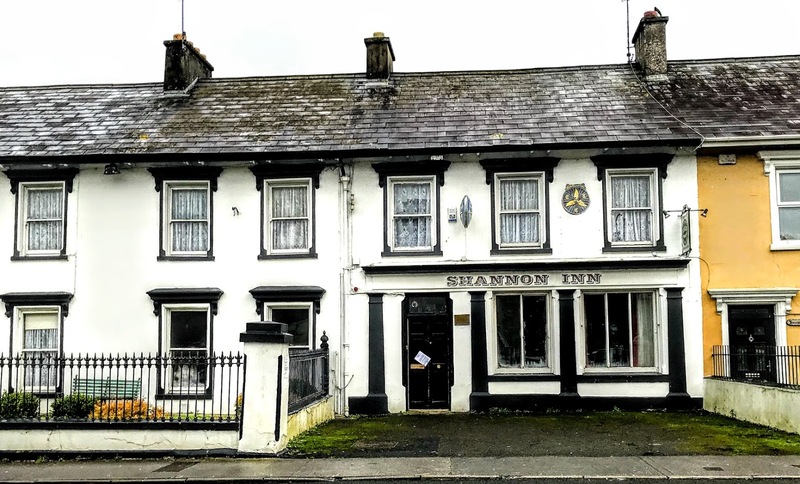 The Shannon Inn is a terraced, five-bay, two-storey house, built around 1800. For many generations, the Enright family were the celebrated hosts at this ‘anglers’ rest,’ until it was bought in 1918 by Denis O’Donovan, a popular local businessman, the Limerick agent for Murphy’s Brewery, and a kinsman of O’Donovan Rossa. A year before the Easter Rising, at the invitation of Patrick Pearse, Denis O’Donovan attended O’Donovan Rossa’s funeral in Glasnevin Cemetery in 1915. The former Shannon Hotel looks like a modest house today, and it was built originally as part of a terrace. But it is worth taking note of because of its subtle, classically inspired façade, and many of its original features still survive, including the render window surrounds, the sash windows and the ornate shopfront. The front elevation is a rendered shopfront. There is a pitched slate roof with rendered chimneystacks, and the overhanging eaves have timber brackets and cast-iron rainwater goods. The lined-and-ruled rendered walls have a render plinth course. The square-headed openings have painted stone sills, render surrounds with entablatures and consoles over one-over-one pane timber sliding sash windows. The shopfront has render pilasters supporting the fascia and cornice over square-headed openings. Doric style pilasters support the fascia with a render cornice. The square-headed display windows have timber mullions and flanking pilasters. There is a square-headed opening with a glazed over-light over the double-leaf timber panelled doors. The pair of rendered chamfered square-profile piers to the south-west have render caps and a single-leaf cast-iron gate. The rendered boundary walls have cast-iron railings that end in a cast-iron pier that has a single-leaf gate. Denis ‘Denny’ O’Donovan and two members of the Royal Irish Constabulary were killed here by a ‘Black and Tan’ auxiliary contingent out of uniform on 17 April 1921, at the height of the Irish War of Independence. A parliamentary inquiry heard three policemen at the bar naturally assumed that the assailants were members of the IRA who had spotted them as policemen. At once they drew their revolvers and opened fire. O’Donovan, who was then 46, had his hands in the air. He was taken out into the yard behind the hotel and was shot dead in front of his wife, two sons and two daughters. His younger daughter, Una O’Donovan, was the mother of the Limerick politician Dessie O’Malley. The killings took place just weeks after the Mayor of Limerick, George Clancy, a former Mayor of Limerick, Michael O’Callaghan, and a young man named John O’Donoghue, had been killed in Limerick on the night of 6 March 1921. It is said that unknown to the assailants, Stephen O’Mara, who had returned to Ireland from the US to succeed Clancy as Mayor of Limerick, was staying in the Shannon Hotel that day, although this is not supported by evidence given within the next 10 days in the House of Lords. Dessie O’Malley later suggested in his memoirs, Conduct Unbecoming, that the incident might have had no political consequences but for the fact that one of the guests in the Shannon Hotel that day was Dr William Harrison Cripps (1850-1923), a surgeon in his 70s, who had recently retired from Saint Bartholomew’s Hospital, London. Harrison Cripps, who was in the dining room in the hotel at the time of the attack, was a former Vice-President of the Royal College of Surgeons and a pioneer in colostomy. He was a son of Henry William Cripps (1815-1899), former Recorder of Lichfield, an elder brother of Charles Alfred Cripps (1852-1941), Lord Parmoor, a former Conservative politician, and an uncle of Sir Richard Stafford Cripps (1889-1952). The two bothers, Harrison Cripps and Lord Parmoor, had married sisters, and both were brothers-in-law of the radical social reformer Beatrice Webb (1858-1942). When Parmoor was made a member of the House of Lords in 1914, he left the Tories and aligned with the Liberal Party, opposed conscription and sympathised with conscientious objectors. An active High Church Anglican, he became the first chair of the House of Laity in the National Church Assembly of the Church of England in 1920. The events that evening had a significant impact on the peace negotiations. They helped secured the truce that was agreed in July 1921, and led ultimately to the Anglo-Irish Treaty signed in December 1921. In 1923, Lord Parmoor accepted an invitation from the first Labour Prime Minister, Ramsay McDonald, to join the Labour Party, and he was appointed Lord President of the Council and Joint Leader of the House of Lords. The two policeman also killed that day, Sergeant William John Hughes (45) and Cadet Donald Pringle (31), are not named on the plaque. But there is a curious genealogical tangle that has also been pointed to by Dessie O’Malley. Denis O’Donovan’s son, Dr Donogh (DK) O’Donovan, married Dr Phyllis Gill, a descendant of an English Quaker family named Priestman. She was a third cousin of Mariann Emily Ennis (1878-1952), who married Lord Parmoor as his second wife. Her stepson, Sir Stafford Cripps, was a Labour cabinet minister in the 1930s and 1940s, an ambassador, a radical socialist, and Clement Atlee’s Chancellor of the Exchequer. During his career, he negotiated with Stalin and Gandhi, and when he resigned from Parliament in 1950 his seat in Bristol South-East was taken at the by-election by Tony Benn. In recent years, it has been alleged by some that the leader of the Black and Tan gang who attacked the Shannon Hotel was George Nathan (1895-1937), and that he also led the gang that killed Clancy, O’Callaghan and O’Donoghue. Natghan was Jewish and gay, and the first Jewish officer in the Brigade of Guards. He cut a lonely figure, and his defenders say the allegations besmirch the reputation of a man who later became a well-known socialist. The name of the Shannon Hotel was changed to the Shannon Inn. 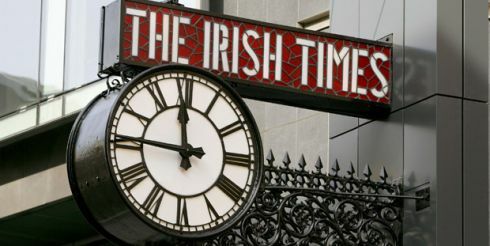 In more recent years, it was run by Paddy Hickey, but it closed in 2014. However, in September 2017, the Limerick Leader reported, the Shannon Inn had been bought by the Ahane Castleconnell Montpelier (ACM) Community Centre. The plans for the Shannon Inn include a heritage centre, an art hub, a youth space, a café and a men’s shed. 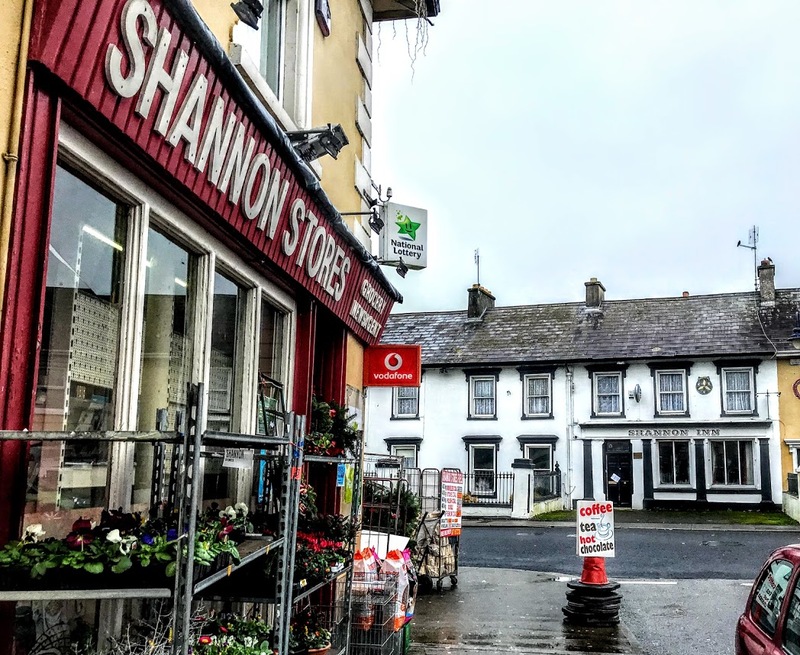 Across the street, on the corner facing Saint Joseph’s Church, Shannon Stores is a detached four-bay two-storey house, built about 1870, with shopfront on both sides. This prominently located building at a central junction in Castleconnell still has several interesting original Victorian features, including the render details, the shopfront and the simple classically inspired façade. The Festival of Nine Lessons and Carols is one of the comforting and stable traditions of Christmas throughout the English-speaking world. It has become so popular in Ireland that it is now a seasonal feature in many churches and cathedrals. Tickets for this year’s service in Dublin’s St Patrick’s Cathedral on Christmas Eve are so sought-after that they were all allocated many weeks ago. Yet, like many Christmas traditions – from the Christmas tree to popular and well-loved carols – this service is a recent innovation, dating only from the later decades of the Victorian era. When Edward White Benson became bishop of the newly-formed Diocese of Truro in 1877, he found an improvised wooden building was serving as his cathedral, and the choir spent the evening of Christmas Eve going from one chorister’s house to the next, singing a carol in each house, steadily drinking and gradually becoming more-and-more tipsy as they made their way through the Cornish town. Benson set about making Christmas Eve more meaningful, integrating it into the Christmas celebrations. And so, the first Service of Nine Lessons and Carols was hosted in his temporary wooden cathedral on Christmas Eve 1880. Benson went on to become Archbishop of Canterbury, and his new service is part of his legacy to the wider church. In its present format, it relies on an adaptation made by Eric Milner-White in the Chapel of King’s College, Cambridge, in the immediate aftermath of the first World War. The 100th service in King’s College Chapel takes place tomorrow. But it would be wrong to think either Benson in Cornwall or Milner-White in Cambridge wanted their lessons and carols to be comforting and soporific: Benson tried to bring the Christmas message into the dark, dismal corners of a town that no cathedral choristers wanted to trudge through in the bleak mid-winter. Milner-White, a decorated war chaplain, wanted to challenge post-war Britain with the dangers of descending into isolation, marginalising the foreigner and ignoring the suffering and violence that brought a divided and war-torn Europe close to self-destruction. It is a message that is equally relevant in a Brexit Britain today. The traditional opening carol for this service, ‘Once in royal David’s city,’ by the Irish-born Cecil Frances Alexander, tells again the story of a homeless pregnant mother who can find no room in a teeming city. About 190,000 homes lie empty in Ireland this Christmas, more than enough to house people living in emergency accommodation. This young mother, who fails to find shelter, gives birth in a squalid stable not fit for human habitation; estimates this week say 3,194 children are being housed in unfit accommodation in Ireland this Christmas. The ever-popular Victorian hymn by Christina Rossetti, ‘In the bleak mid-winter,’ is sung regularly at this service. She was part of a group of Anglo-Catholic socialists linked with the Pre-Raphaelite Movement, and her winter was made bleak not merely by the snow or the earth “hard as iron”, but more by the hardness of heart that made the poor lonely and isolated. Yet, for Rossetti, the greatest gift to offer is not dependent on wealth or spending power, but on simple human love. After the Ninth Lesson, the service ends with two traditional hymns, ‘O come, all ye faithful’ and ‘Hark! the herald angels sing.’ The first of these paired hymns, translated by Frederick Oakeley, speaks of fear and poverty in ways that are more challenging than they are consoling. The second hymn, by Charles Wesley, is imbued with promises of peace on earth and joy for all nations, in contrast with forces of fear, isolation and death. The fear of terror in Britain this year after the attacks at the Manchester Arena and London Bridge means King’s College Chapel has abolished the early morning Christmas Eve queue that has been part of the seasonal tradition, and entry tomorrow is on a ticket-only basis. But concentrating on changes such as this detracts from the main message of the carols being sung and the lessons being read. The Christmas message is plain and simple. It has nothing to do with the judgmental, harsh and deceptive lying of those who supported Judge Roy Moore and continue to back Donald Trump while calling themselves “conservative Evangelical Christians”. They wish to conserve neither the values of Christianity nor the good news of the Gospel. If people wish to “put Christ back into Christmas”, they can put into practice the message of love heard in the Nine Carols and Lessons this season: feed the hungry, clothe the naked, house the homeless, welcome the despised and the marginalised, care for the sick and the lonely, love our enemies, and love others as we love ourselves. It is a simple message, preached in the Sermon on the Mount and given flesh on the first Christmas night. We have just two days to go to Christmas Day. We are at the end of the last week of Advent, and tomorrow is Christmas Eve. Give thanks for the commitment of the Church of Bangladesh to reach out to poor and vulnerable communities in the name of Christ. Today, the calendar is headed ‘O Emmanuel,’ referring to the seventh of the O Antiphons in the final week of Advent. Today, the calendar suggests reading Luke 1: 67-79. Remember Christians in the Holy Land. Pray for peace there, and throughout the world. Remember all living in darkness, pain and suffering, all living under occupation. Malachi 3: 1-4, 4: 5-6; Psalm 25: 3-9; Luke 1: 57-66.